Makers of sterling and gold novelties and jewelry. Maker of hand wrought sterling hollow-ware in the Arts & Crafts style. The business went to Jonathan L. Locke upon Hewes' retirement in 1950. Abraham Hews, Jr. and Augustus H. Hews. In partnership with Augustus H. Hewes of A. Hews Jr. & Co. 1847-1853. C. Heydorn and Richard Imlay. In the partnership of Heyer & Gale with Jesse Gale 1807-1808. Upon Heyer's death in 1828, his widow took over the business until 1835. William Hibbard, Franklin Spencer and Adolphus C. Bartlett. 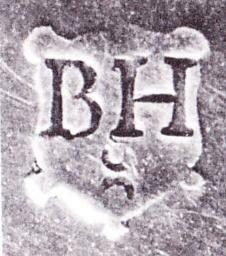 Successor to Hibbard, Spencer & Co. A hughe hardware manufacturing company, they produced silverplated flatware and holloware and a small amount of sterling wares c. 1884 to about 1930. The OVB trademark stands for "Our Very Best." Aaron H. Higbie and Ransom Crosby. Succeeded by Hildeburn & Bro. 1852-1871. Silversmiths & jewelers. A partnership between Samuel Hildeburn and James Watson. In the partnership of Hildeburn & Watson 1829-1833. Charles Hill and Alexander Coffin. Ross. Gold pen manufacturer and jeweler; also made sterling souvenir spoons. A partner in the silverplating business of Küchler & Himmel 1852-1853. Operated the A. Himmel Silverware Manufactory 1869-1877. Makers of compacts, vanity items, and jewelry. Horace Seymour Hinsdale and John H. Atkin. Was in the partnership of Clark & Hinton 1854-1857. Primarily a jewelry manufacturer, also made sterling souvenir spoons. Makers of sterling hollow-ware. Succeeded by Fisher Silversmiths. Samuel L. Hoard and Claude Avery. Succeeded by Hoard & Avery. Was in the partnership of Steele & Hocknell with James P. Steele 1834-1835.